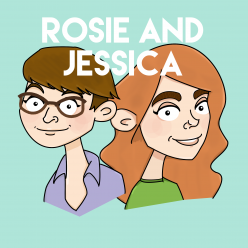 In episode 54, Rosie and Jessica have fulfilled a request by going on a literal Day of Fun. Rosie has cooked enormous lunches, Jessica’s been to a shindig and many knitted toys are on the horizon. Plus discussion of Over the Garden Wall and large amounts of cod. Wheel of cheese. We went to see Fashion on the Ration at the IWM. Disney Princess nails, lovingly ripped off from @ohsewjessica. We have Cinderella, Ariel, Snow White, Rapunzel and Belle. Took an age but I love love love them. Easter nests. Went rogue with corn flakes not shredded wheat. No regrets. Rosie has finished Linda Mary’s Teddy Bear Aran Sweater – doesn’t Rigby look cosy? Rigby modelling his new sweater. I learnt to cable. He is the cutest. We make quite the pair. Rosie has now cast on a knitted Humphrey and thoroughly recommends all things Humphrey’s Corner. There’s lots to like by Alan Dart, especially Hibernating Harry, the Hot Cross Bunny and some medieval mice. From Loly Fuertas, Rosie particularly liked the tea cosies and Amelia (b)Earhart. Rosie’s brain has been taken over by Over the Garden Wall. Nostalgia Chick joins The Baby Sitters Club. This is too much cod.